I know you’ve missed me. I’ve been busy spring cleaning my apartment. I’ve been going through all of my closets, my storage areas, everything. 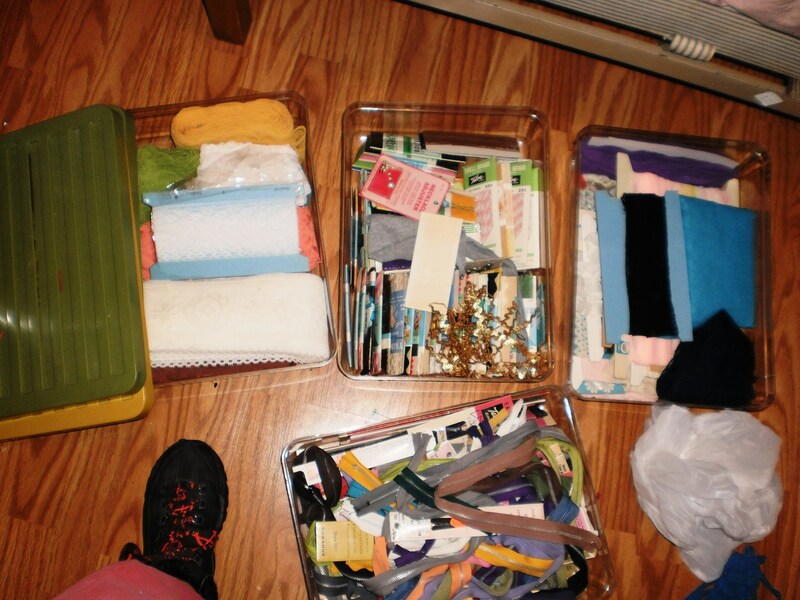 I’ve come to realize just how much of a fabric hoarder I am, lol. 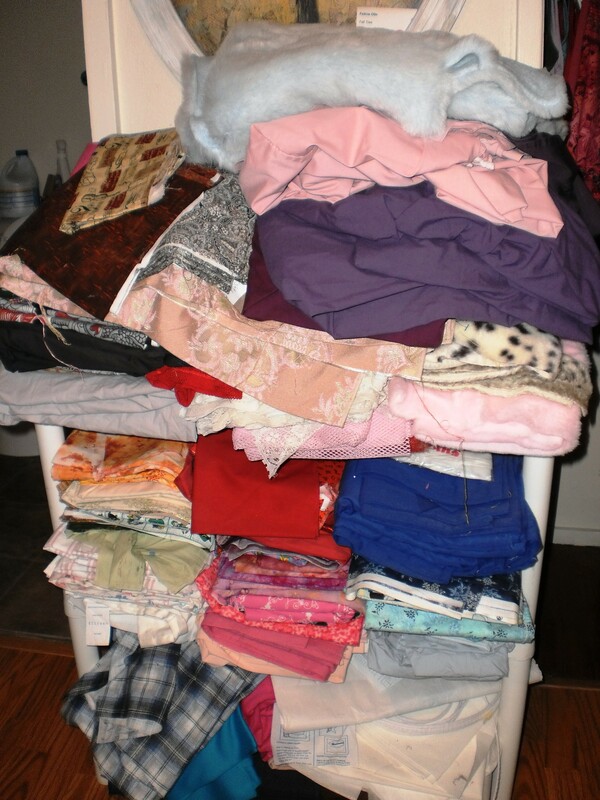 My tower of fabric. This is where I keep my “good” cotton and other special fabrics. 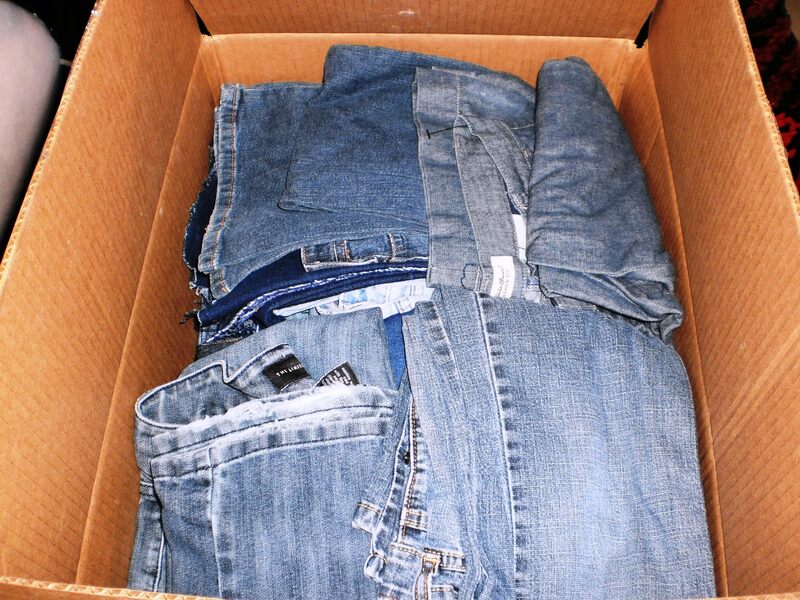 One of two boxes of denim that I have. Hoping I would get more orders for the NowhereMan Jacket (read the whole story, Part 1, 2 and 3), I stocked up. It seems weird how much interest there was when I first made it, I had someone offer to buy the original before it was even finished. ::shrug:: I’ll do something with it eventually, I have plenty of ideas. A couple rolls and a box of of quilt batting I picked up via Freecycle this past summer. I’ll use them eventually. I still need to settle on a design I really like for the Nataraja Quilt. Little boxes of notions that an elderly woman gave me when she moved some years ago. I have made use of these again and again. Especially the zippers. Thank you elderly lady. 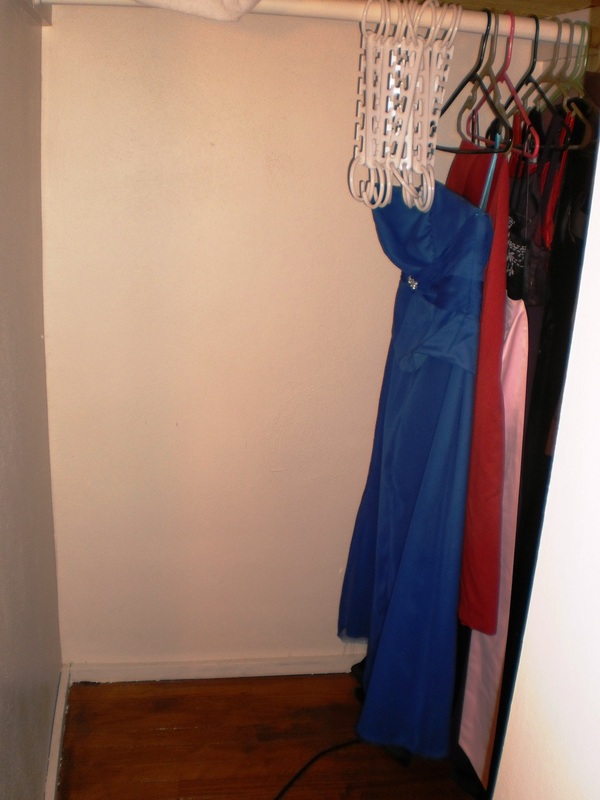 A clean closet!! These dresses are prom/ formal dresses that I picked up from thrift stores that I intended to alter (this was around the time I made some formals for a fashion show in Springfield, IL) I don’t know that I’ll ever get around to doing anything with them. I should probably take them to a consignment shop. Although, when my friend Julia got married back in 2010, I did get my bridesmaids dress from this collection (that’s it in the front) and all I had to do was shorten the skirt. I have yet to determine whether this works to my benefit or to my downfall, but, I am forever juggling multiple projects at the same time. More often than not, I start a new project because I’ve gotten fed up with a previous one. 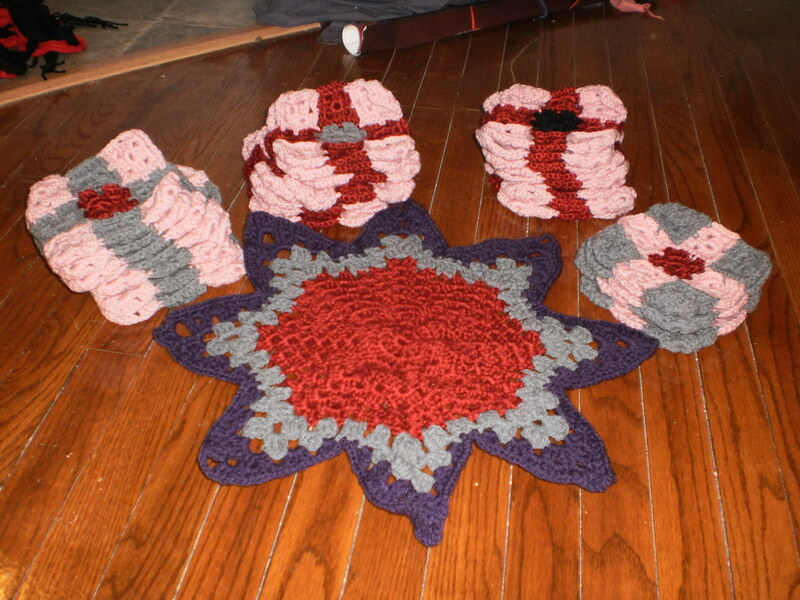 I’m trying to be better about going back and completing already started projects… I currently have 4 projects I am in the middle of: The Rag Rug, a jacket I started around this time last year, a latch hook kit, and an afghan I started in September. The only thing anywhere close to completion is the afghan. As of right now, I have completed 49 out of 176 rows of the rug. I’m not nearly as far along as I originally hoped to be by now. (Granted, I’d be at least 5 rows further along if I never had to undo and redo rows because I didn’t pay attention to the pattern.) There are multiple factors for this. The project isn’t portable at all, so I only work on it when I am home. When I *am* home (when I’m not at work, out of town visiting family, at an art show, or spending time with my boyfriend), my attention is also being taken by trying to clean my apartment or watch a movie, which is hard to do while I work on the rug as my back is to the TV. It’s also while I am at home that I work on writing these blogs, check email, Facebook, etc. As the weather gets nicer I find myself getting cabin fever quicker, always wanting to go for a walk and enjoy the sunshine. Of course, allowing myself these pleasures cuts down on my productivity. However, there is one other reason I’ve been avoiding the rug lately: I’ve noticed that the lower rows of the rug are bulging out. I don’t know if this is a tension issue, or due to using scrap material of varying thicknesses, or what. I don’t know if this is something that can be easily smoothed out once the rug is taken off the pole. Because of this, I’ve been somewhat putting off rug production – I’m worried I’ll do all the work, think it’s done, but then have to go back in and fix it somehow. 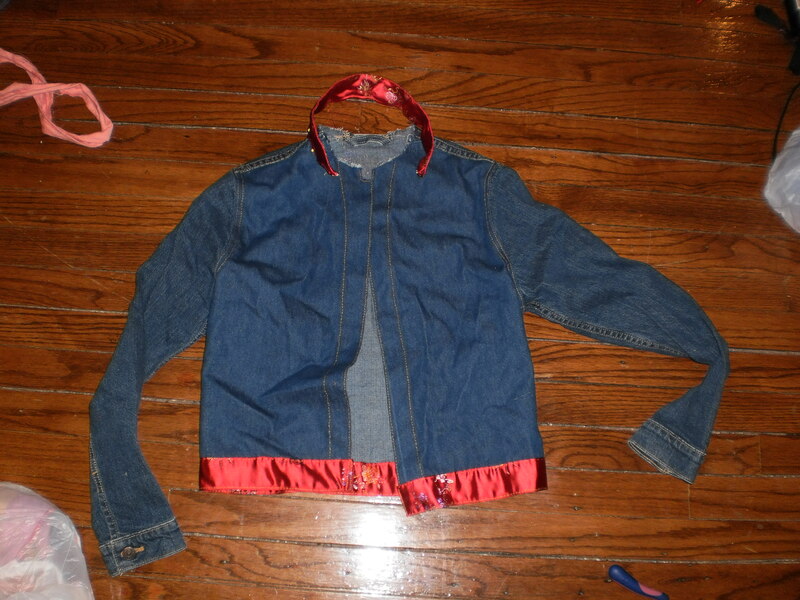 I started working on the Mandarin Jacket shortly after I finished the Nowhere Man jacket early last year. I replaced the entire front panels (by hand!) so that I could create and utilize frog button closures. I then used brocade to make the bottom band and the collar. The collar was hard for me as I had no pattern to work from and was using scrap fabric to try different variations. Because an iron will melt brocade without a press cloth (and a press cloth obstructs my view of the fabric), I had to create the creases with tiny hand stitches near the edges. After all that, I learned a valuable lesson when trying on and trying to close the jacket: brocade has no stretch. Suddenly, a jacket that fit me fine before no longer wants to close. 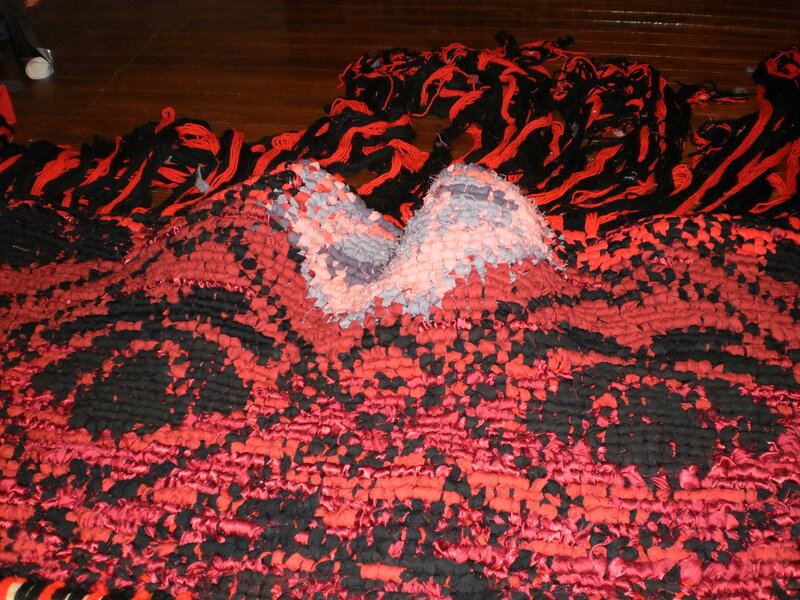 I was so wrapped up in the concept that I failed to consider the properties of the fabrics I was working with. I haven’t touched it since, but I still have it, waiting for the day when I will come back to it. I picked up the latch hook kit from the I.D.E.A. Store a couple months ago. 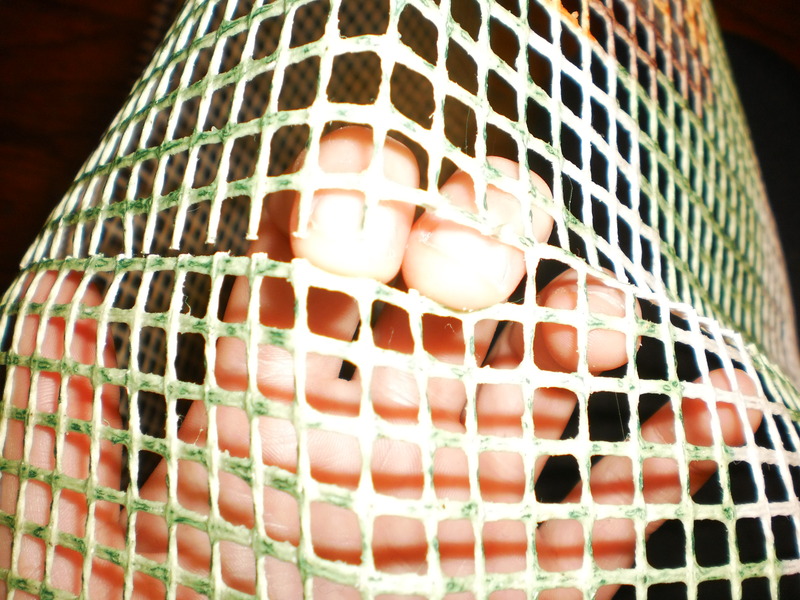 I knew it had a hole in the mesh when I got it. I’ve just been trying to work around the hole in the meantime. 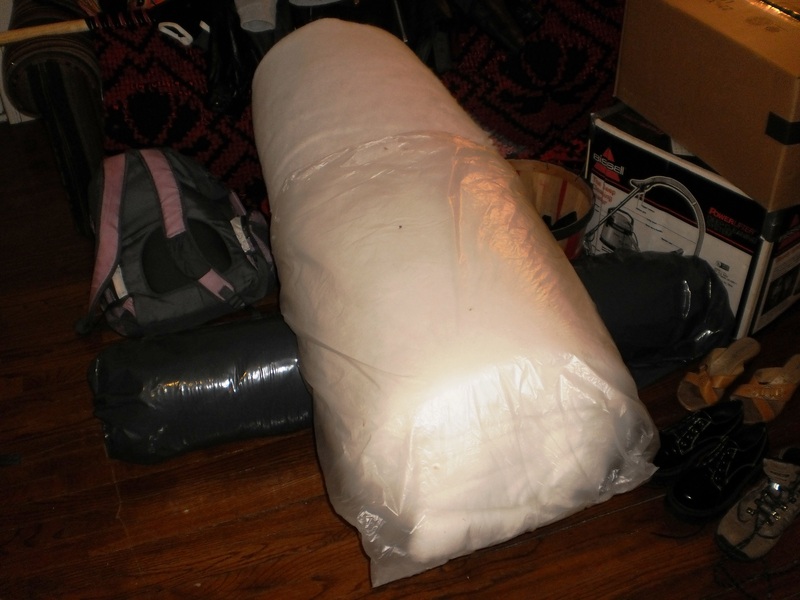 I know I have extra mesh around my apartment somewhere… Until I find it, this will wind up in the unfinished pile. I started the afghan when my mother came up from Florida to visit. I knew I wouldn’t be able to work on the rug, so I began this endeavor so I would have a decent travel project. The pattern I’m following is called “Blue Star” from the book Blue Ribbon Afghans. This is probably closer to being finished than any other project right now, simply because it is portable – I take it to work and to my boyfriend’s all the time – and because it doesn’t take much brain power for me to follow a pattern (unless I stumble upon any errata).